When I was little, maybe between the ages of five and seven, I wanted to be a teacher when I grew up. I loved my teachers at school, and because of them (or maybe just because of me) I loved school. Also, my mother was a teacher, and I thought she was pretty great, so I would become a teacher, too. Later, when I was a little older, I wanted to be a veterinarian. We always had lots of animals, mostly cats and a dog or two. The cats lived outside and were called the Outside Cats. I was partial to the cats, and I still am. I used to name them very clever names, like Blackey and Whitey and Pumpkin, based on the color of their coats. There was also Mama Cat, and you can guess why she was named that. The first cat that I considered my own was called Mindy, named after a character on my then-favorite television show, Mork and Mindy. One day, I went with my mother to take one of the cats to our veterinarian. I don’t recall which one, but I’m certain he or she must have been very ill – regular checkups were not a thing with our family back then (neither for animals or humans). I watched the vet take the cat’s temperature, using a rectal thermometer. I no longer wanted to be a vet. During my high school and college years, I became convinced that I would be a clinical psychologist. Silence of the Lambs came out in 1991, during my first year of college. I was intrigued by Jodie Foster’s character, and I thought that maybe I would study forensic psychology. I liked the idea of delving into the minds of people who needed help, figuring out why their minds worked that way, and hopefully helping them in some way. I stuck with this plan, and I graduated from college with a B.S. in psychology. I was pleased with myself for knowing what I wanted to do and doing it. It was only when I was halfway through a Masters-level graduate program in psychology that I realized I really did not want to spend the rest of my working years as a psychologist. I wanted to help people in a different way. I wanted more science and less theory. I wanted to be a medical doctor. 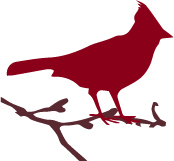 Let’s now flash forward twenty years – wow, that sounds like a long time – and here I am, an academic hematologist-oncologist. Not only do I get to see patients, but I also get to do some research, I get to write (academic stuff, sure, but sometimes it gets published! ), and I get to teach the next generation of doctors and oncologists. I updated my curriculum vitae last week, something I make myself do every few months, and I was reflecting on my career in medicine. My path to becoming an oncologist was winding and long (so long) but I’m incredibly happy with what I’m doing. As cheesy as it sounds, I really love each aspect of my life in academics – the clinical work, the research, and the teaching. It’s that last aspect, the medical education piece, that I’ve been surprisingly delighted with. And I remembered that, when I was a little girl, so many years ago, I wanted to be a teacher when I grew up. 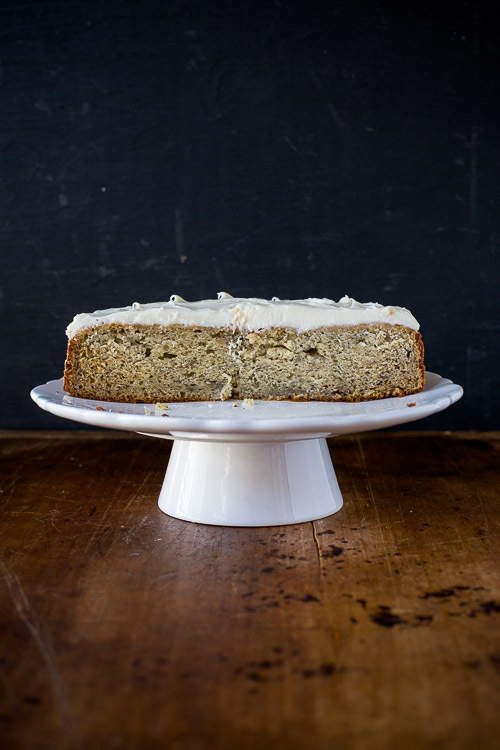 The story above has nothing to do with this banana cake with cream cheese frosting, of course. But this is a great cake, ad I wanted you to have it. So consider this recipe a bonus. The icing on the cake, if you will. 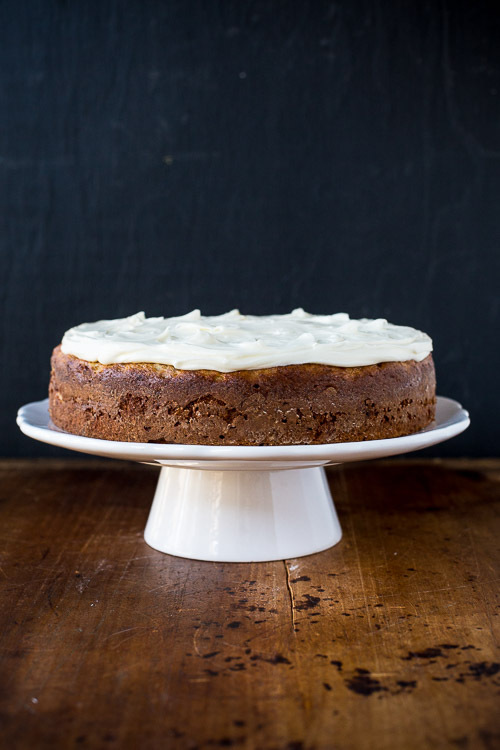 The pairing of cream cheese frosting with banana is a favorite of mine. The cake is wonderful without the frosting, but a top coat of frosting really makes it a special dessert. Preheat oven to 375 degrees with rack in middle position. Butter a 9-inch round cake pan, line with a parchment round, then butter and flour the parchment-lined pan. In a large bowl, using an electric mixer on medium speed, beat together softened butter and granulated sugar until pale and fluffy. Add eggs, one at a time, and beat until well blended. Beat in bananas, yogurt, vanilla, and rum (mixture may look curdled). Bake until cake is golden and a toothpick or cake tester inserted in center comes out clean, 45 minutes. Cool cake in the pan on a rack for 20 minutes, then turn out onto rack and cool completely, right side up, before frosting. Using an electric hand mixer, beat cream cheese and butter in large bowl until smooth. Beat in vanilla extract. Gradually add powdered sugar, beating until frosting is smooth and creamy, about 2 minutes. 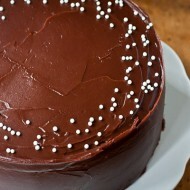 When cake is cool to the touch, spread frosting evenly on top of cake. Hugs and prayers continue for your entire family. Beautiful cheesecake. Enjoy that upcoming and much needed vacation. You guys take care of yourselves. I’ll be thinking of you and your family. And that cheesecake! We’re here for you anytime, MJ! Your Mom’s blog post hit me in the gut. I’m thinking of her & praying her lots. I hope she has easy days ahead and can heal. PS Is your maiden name George? Mine too! I really hope things get better for you, your Mum and Dad, I really hope you enjoy your holiday tpp because I think you deserve it. I absolutely love key lime cheesecake and I haven’t had it it so long, it brings back good memories from when I was tiny. I haven’t even read your mother’s blog yet, and I’m a weepy mess. Sending you big hugs. You know we’re all here for you. MJ such a sad, beautiful, hopeful, and articulate post. You are amazing. Sending love and hugs to you all, especially your mum and dad XO As Gail says, we’re all here if you need us. You have popped into my mind multiple times since I read the post about your dad’s transition to the nursing home. You are in all of our thoughts. Key lime in any form has always been a favorite of mine, and this cheesecake looks like a “must try”. Continuing to keep you, your folks, and family in my thoughts and prayers. May seem odd, but I feel the need to thank you. Thank you for sharing your stories. It’s comforting to connect with someone who clearly loves her dad and mom, but is moving through a difficult period in life’s transitions. I relate. Many can, I’m sure. Know you, too, are not alone. We’re all out here walking along side, holding you up in our hearts. Do get some r & r on your vacation. Oh, and that cheesecake looks divine. I’m fairly new to your blog and did not read about the initial surgery until today – what a shock all this must have been for you and your mother. Prayers continue for you all – hugs too – I agree you both need time to recover from stress before moving forward with other decisions. I wish there were a way to make this easier – it sounds like you’re all doing the very best you can. There will be so many good memories mingled with these difficult ones. Try to remember the times he offered his steady hand talked about your babies with knowledge and pride. I learned after my dad’s death that, the day before his heart attack, he was pressing a new snapshot of his toddler grandson – our son, now 22 – into the hands of friends at the post office. I took a lot of comfort in that and choose to remember it over details that have become less vivid with time. Time like these are never easy. I will certainly keep you and your family in my thoughts. And I’m sure cheesecake helps, as I know baking for me certainly does. All the best. I love that layer of curd! And I’m thrilled that things feel calmer, better. you and your family is in my prayers Merry. I have realized how great it is to be surrounded by blogger community during tough times like this and I am glad baking is your comfort. Take Care. Oh my goodness!!! Your images are spectacular! My eyes “taste” the creamy tart-ness of this cake! So wonderful! And where did you find that nice, moderately high cake stand? The cake stand came from Crate & Barrel a few years ago. I love it and keep meaning to buy another! Wow , I love that there’s even lime curd in there! 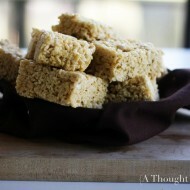 Amazing recipe! Pinned. I made this on saturday night for some friends birthday get together on Sunday night!!!! it was a hit! maybe one of the best cheesecakes i’ve ever had! Thanks for letting me know, Lucy. I’m so glad that everyone loved it! Prayers for you and your family! As for your key lime cheesecake…it looks divine. 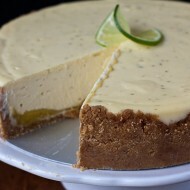 I am a huge key lime fan, and know I will like this recipe.